BioTrust Metabo379 Review – Is it effective? If you’ve ever taken fat burners before, you might be all too familiar with the stimulants tied to it. There are various stimulants available in fat burners; so much that fat burners have become synonymous with stimulants. However, stimulants aren’t preferred by some, and that led to the development of non- stimulant based fat burners like Metabo379. 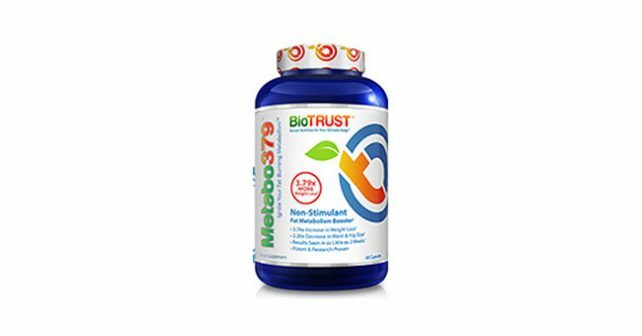 BioTrust widely markets Metabo379 as one of the best fat burning supplements that doesn’t have a stimulant ingredient. It claims to boost your metabolism to increase the amount of fat you burn at a certain rate. BioTrust also claims that with Metabo379, you can expect results in as quickly as two weeks after taking the supplement. Sounds too good to be true? We’ll find out more as we dig deeper with our Metabo379 review. Metabo379 is rife with promises. First, Metabo379 derives its name from one of its claims – that it can increase your metabolism to as much as 3.79 more than a placebo. It also claims to double the rate at which you trim fat from your hips and waist. As stated earlier, Metabo379 claims that you can expect results in as early as two weeks. Based on our experience with fat burners, almost anything can get you results in as quickly as two weeks, as long as you follow the program. Is Metabo379 any different? People who are sensitive to stimulants would opt to use a stimulant-free fat burner like Metabo379. People with cardiovascular diseases are advised to stay away from stimulants, no matter how mild or strong in order to prevent the aggravation of their disease. Therefore, the typical ingredients found in fat burners like caffeine, yohimbe, and ephedra are out of the question. Metabo379 claims that it can be just as effective – or even more effective than stimulant-based fat burners. Upon studying the content of Metabo379, we learned that it’s true that the formula is free of the common stimulants, and its primary fat burner is Garcinia Mangostana. Cambogia Mangostana, not to be confused with Garcinia Cambogia, is one of the lesser-known species of Garcinia, which is thought to be inferior to Garcinia Cambogia in terms of their fat-burning capabilities. In comparison, there are no studies that show that Garcinia Mangostana (mangosteen) is widely studied for an array of alternative medicine uses for diseases like Cancer, hypertension, Tuberculosis, High cholesterol – but never fat burning. Unlike Garcinia Cambogia which contains Hydroxycitric Acid (HCA), a proven ingredient in suppressing appetite and fat, Garcinia Mangostana is just high in antioxidants, which is GREAT in other aspects, but not fat burning. Its other ingredients like Sphaeranthus Indicus and its vague Sigmalean Complex proprietary blend offer little explanation on what they actually do to help burn fat. It may all appear that BioTrust Metabo379 isn’t really the product that we hoped it would be based on its ingredients, but its clinical reviews show otherwise. We were able to dig up a double blind placebo test on Metabo379, and the results were too good to be true. It shows that the group which took Metabo379 showed twice as much weight loss compared to other individuals who took placebos. Whether the test is authentic or not is not us to judge, but you’d have to admit – if this test is true, we might have one of the best fat burning pills on the market today. We practice forming conclusions based on the facts presented to us – It’s great that Metabo379 gives users an alternative non-stimulant-based fat-burning pill instead of just sticking with the proven blend. However, the ingredients give us little faith that the product works. Don’t get us wrong, though. The product is GREAT for your body, just not for its fat-burning effect. If you’re looking for the best fat-burning supplement without all the stimulants, then your best choice is Garcinia X. Garcinia X contains Garcinia Cambogia with 60% HCA, a proven formula to help you reduce the amount of fat that the body stores, and it comes with a strong appetite suppressant effect to help you maintain a healthy diet. If you’re serious about losing weight, then Garcinia X is the right supplement for you.